This week, my two year old son grew an attachment to a certain keyboard toy that plays demo tunes. It was cute to begin with, but when I’ve heard the demo tune on repeat for the zillionth time before lunch, I just want to take out the batteries. Then I realise, there’s a cupboard full of other musical toys that don’t require batteries. Oh well, at least those don’t have demo tunes. In a world filled with lights and sounds galore, it is nice to embrace a world where no batteries are required; even if it is only for awhile. Play bandages (made out of felt and optional velcro) by Pen Pals & Picture Books. Loose parts play with pipe cleaners by The Fairy and the Frog. Scrap Paper Dolls by A Happy Song. Please take a “Featured at Lessons Learnt Journal” badge from the sidebar. 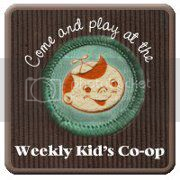 Take a “Come and Play at the Weekly Kids’ Co-op” badge from the sidebar and link up. The Weekly Kids’ Co-op is co-hosted by a group of 50 fun kids’ blogs. Add your child-focused link here and we’ll share your idea across all of our child-focused blogs. We’ll pin the best on our very popular Weekly Kids Co-op Pinterest board (which has over 260,000 followers). Don’t forget to follow The Kids Co-op on Facebook.